Woods and McIlroy Agree, Stress Kills Your Golf Game. Five Easy Fixes. Why is it, on occasion, pros like Rory McIlroy begin by playing one of the greatest rounds of golf and end up with one of the ugliest scorecards at the end of eighteen holes? What happens when that mental breakdown occurs and what can be done to stop it? Since that fateful Masters, McIlroy has considerably upped his game. Instead of stressing that he was trailing in the DP World Tour Championship in Dubai, Rory kicked it up a notch when he needed it most and birdied the final five holes to win. European Tour Golfer Paul McGinley called Rory "Tiger-esque" as Woods "laid down the platform over the last decade as to how to go into overdrive in a tournament." Rory McIlroy stepped up his game, acknowledged his position, embraced it and moved forward with momentum: Tiger Woods although once the teacher of stress management, has done much damage to himself and to his golf game through "suffering and self-sabotage" and, due to this ongoing trauma, may never return to his former greatness. Although the average golfer may never achieve the focus that either McIlroy or Woods can actualize during a round of golf, the combined efforts of Wortmann and Ford have written, "Hijacked By Your Brain: How to Free Yourself When Stress Takes Over" offering easy, do-it-yourself strategies you need to know to make stress work for you, not against you. 1. "We try to hit the ball harder." The moment we think about hitting the ball further than we usually do, it triggers an alarm (the amygdala) in our brain. Our brain knows our driver usually goes a certain distance. It knows what our go-to or stock swing feels like. The moment we try to get a little more out of it, our brain knows it's not possible, it wants to prevent us from making a mistake, and the ensuing tightness from the stress response causes a tight swing. Tight swings produce over the top snap hooks or blocks when we don't release the club. 2. "We try to make putts." When we try to make a putt, we focus on the result rather than the process of making a great stroke. The only things we can control when putting is the direction we start the ball and how hard we hit it. Just like trying to hit the ball too far, our alarm wants us to stay focused on making a good stroke. The thinking center in the brain can only focus on one thing at a time. Thinking about making the putt (the future) makes it impossible to focus our mind and body on what we need to do in the present to make a firm, confident stroke. 3. "We think we can play our best without warming up." Our memories centers in our brains are filled with the great shots of our lives. The problem is some days we've got our "A" game; other days, we can't hit a fairway even if it's 200 yards wide. Warm up is the time where you let the brain see what the body is doing that day so it can help us focus on the shots we know we can execute. 4. "We think there is something wrong with us when we can't take the shots we hit easily on the range to the course." The pressure of playing, whether with buddies or in a tournament, is a totally different environment than the range. The brain doesn't care if you miss a shot on the range. Your alarm cares deeply if you're playing for a score. It doesn't want you to miss, so it sends a stress signal (that's the tight feeling, nervousness, or breathing quickly) to make sure you pay attention to what you're doing. The good news is that the answer to playing better on course is a fun one for every golfer: you simply have to play more on course or in competition and your brain will get used to the pressure (as long as you work on focusing on consistent swings, not hitting it harder or thinking too much about results). 5. "We think one good round means we've figured the game out." Golf is different every shot and every round. That's what makes it challenging. Our brains love a challenge; that's why even playing bad golf can be rewarding. The road to better golf is lumpy, often with more terrible and mediocre rounds than great ones. We have to celebrate the days when we have the energy, time, and serendipity to play well, and realize that the bad rounds are a chance to learn what we need to practice, both the mental and physical skills of the game we love. Celebrating the great rounds as rare and precious is how we value the memory. The stronger our emotional attachments to memories, the more easily we can repeat what we've done well before. Voice your opinion on Twitter @Golf4Beginners and friend us on Facebook. Click for more information on "Hijacked By Your Brain: How to Free Yourself When Stress Takes Over"
Unusual Golf Courses from the Earth to the Moon! When it comes to playing golf, there are many places to execute your best shots from local courses to some great destinations around the world. Traveling globally let's you experience unique and even strange golf courses during your travels. Golf writer Angela Harper shares her favorite adventures and unusual destinations with Golf for Beginners blog. 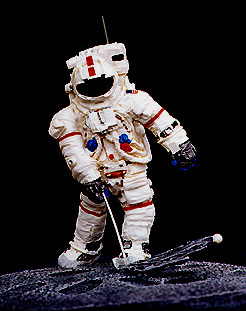 We know this is still in fiction, however American astronaut Alan Shepard was the first man to ever hit a golf ball on the Moon. Ever since then the Japanese company Shimizu Construction has a plan for a golf course on the moon complete with blueprints for eventual future development when and if the opportunity arises. Very optimistic and daring...right? By far the longest golf course in the world, this Australian wonder spans a whopping 1365 km. The average distance between two holes is 66 km so you better hope your golf cart is capable of running for miles upon miles. Take plenty of water and a great deal of patience as the course may take up to almost a week to complete. And of course, once again here we are in Australia: this particular course is a very strange experience since the area is so dry and arid there is simply no vegetation. You can also play at night using phosphorescent golf balls which make it unforgettable. It makes us wonder whether you need night vision goggles to play or do they use powerful flashlights to illuminate the area? Night golf, however, requires an appointment and a minimum of four people to stage so choose your friends (or enemies) wisely before embarking on this adventure. By far the world's coldest golf course where everything is played at sub-zero temperatures at otherwise the same rules. You are using a high-contrast orange ball since the surface you're playing on is completely white and with slightly larger holes and shorter distances between them. Dress warm and enjoy a golfing experience like no other. Located in Sun City, South Africa this course is a beautiful experience with gorgeous greenery in an otherwise more arid climate. It is mostly known for its aptly-numbered hole number 13 which has real living crocodiles living near it so the place usually serves as a graveyard for golf balls that ventured too far into croc territory. Prepare to lose a few golf balls playing unless you're willing to tackle the crocodiles in search for your missing ball. If you are feeling very adventurous and you don't mind the friendly North Korean military base not far away from the golf course, their watchful eyes and the nice fairway surrounded by landmines you might have a great time. Then again its only one hole and the only chance you'll have to experience that would be if you are working with the UN so its hardly a working golf course, however it is worth the mention because of its interesting location. Guest post by A. Harpert- a passionate traveler and adventurer by hobby and calling. She's a real expert in finding the most appropriate rental and vacation homes for your perfect trip. The snow will soon be blowing in and it will be time to go sledding, build snowmen and drink hot chocolate. Put another way, the cold is here so now it is time to bundle up and try to stay warm because it is too cold to go outside and play golf. Mike Baird tells us how we can keep our game fresh through the cold and silly season. With the cold weather, there is no way to play golf, improve your swing or your overall game...or is there? Winter time also brings the Holiday season, which makes it extremely difficult to do anything but eat turkey, cookies, cakes and pies. But working on keeping your cardio up and strengthening your arms and legs can really help you to improve your overall game once the warm weather returns. Putting is an essential part of any golf game. Practicing your putting on the family room carpet will help you to practice and feel more confident in your putting skills for when it counts later on. The carpet is similar to how it feels out on a green and it is convenient because you can find a spot to practice in your house. Use cups as holes and the furniture in the room as obstacles. Drilling and or putting your strokes in the garage or a gym will help with your swings. Other golf experts have recommended a putting drill in which you place only one hand on your putter then practice five foot strokes for ten minutes. Research other drills and training aids that will help your swings and your game then practice them over and over again. Practicing those drills and repeating those drills will help with your consistency. If you want to play like the golf pros you have to watch the pros and learn to do what they do. Do your golf homework by watching the Golf Channel. This will probably be the easiest thing to do this winter. Watch the pros and TV shows like The Golf Fix in order to see others learning and working out problems in their golf game. Mike Baird is founder of GolfGator.com and a PGA Pro who teaches golf lessons full time and also likes to write about putting aids. As Mickey Mouse stands guard at the par-3 sixth hole of Magnolia Golf Course, some PGA Tour players this week might be lulled into a false sense of security believing that Mickey is their friend. Think again for the trap has quite a snap to it! The unique Mouse Trap carved of sand with the assistance of ninety-six additional bunkers helps to make Magnolia Golf Course the second most difficult within Walt Disney World. Course length (7,516 from the tips), undulating greens and water introduced into eleven of the holes had Payne Stewart claim the course record of sixty-one one day and a seventy-six the following day. Stewart's take on Mickey? "Avoid Mickey and two side sand bunkers for best result." Five of the golf holes on Magnolia extend to over five hundred yards and even though the fifth hole, a par-4, 492-yard monster, is considered to be Magnolia's toughest hole, Lanny Wadkins claimed the 17th, a 485-yard par-4, as "the most dangerous hole on the course...give me a 4 here and I'll run to 18!" Magnolia was a 2010 Kodak Challenge golf course; natural wetlands, alligators and eagles seemlessly combine with the ability to salvage drives off of wide fairways and plan putts through exceptionally well-maintained greens. As long as you are a solid bunker player, avoid the water and know your distances (Disney says it has the latest GPS technology on their golf carts), playing it safe should yield positive results. Take a virtual tour of Magnolia Golf Course.